One of my high school friends is pregnant for the first time, and I'm so excited to attend her baby shower this weekend. Both she and her husband have been through some rough times and have been wishing for a child for awhile now, so that makes this pregnancy even more special. I'm so glad that she has been able to experience the joy of carrying a child, and I pray that her delivery goes well. I know that they both will cherish and love that little boy growing inside and that they will be wonderful, caring parents. "You and Me. Me and You. We're not just two. We're three." We all love oohing over little babies and here's a newly released picture book to ooh over as well. 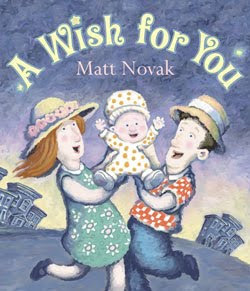 Matt Novak wrote and illustrated a book that's perfect to give to first-time parents titled A Wish for You . It's about the joy of waiting for a child to arrive and the journey of becoming a family. The book begins with two people that meet, get married and then spend some time traveling. They want children, but their wish at first isn't coming true, so they feel a little blue. Then the wife becomes pregnant, her belly expands and they begin their preparations that include buying a cartload of toys. Eventually their wish becomes a reality and the baby is born to a chorus of Oooos. The three, a family complete, sail off on new and exciting adventures together. Though simply written, Novak obviously took great care in choosing the perfect words and the rhyme that results is fun. All the verses end with the "ooo" sound, except the very last phrases. He captures all the emotions that a pregnancy and subsequent birth brings and even manages to add a little stinky diaper humor. The illustrations have an impressionistic, fuzzy-wuzzy quality. I love how hats bring the two characters together and that they continue to wear hats throughout the book (though not during the birth). It's such a joyful book and it provides a delightful way to show a child just how much they are treasured and wished for! I'll certainly give a copy to my friend for her baby shower. I love giving a book to a new mommy. This one sounds great! Sounds adorable and perfect for new moms! Thanks for sharing!